Yesterday I showed you picture of the chives flowering. As I don’t want them to go to seed, I cut them down tonight. 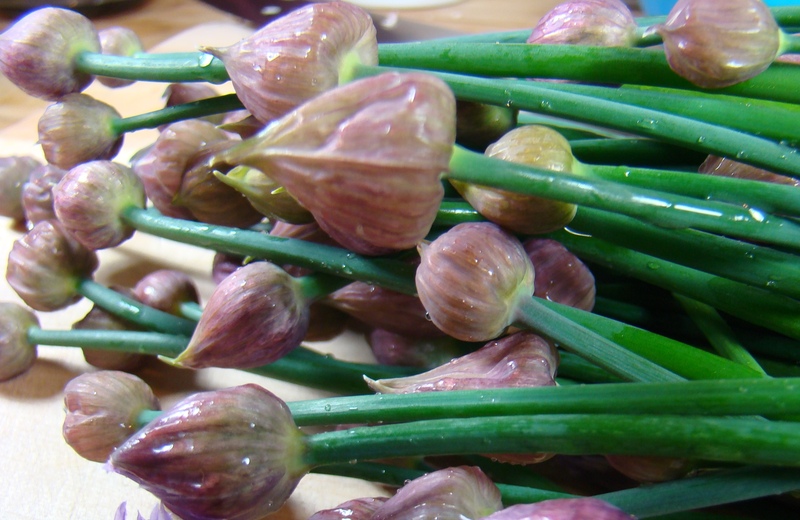 Chive flowers may be used in salads, to flavor vinegar or in an omlet. Being a weeknight, and pressed as always for time, I decided to do a quick stir fry with some shrimp I took out to defrost this morning. 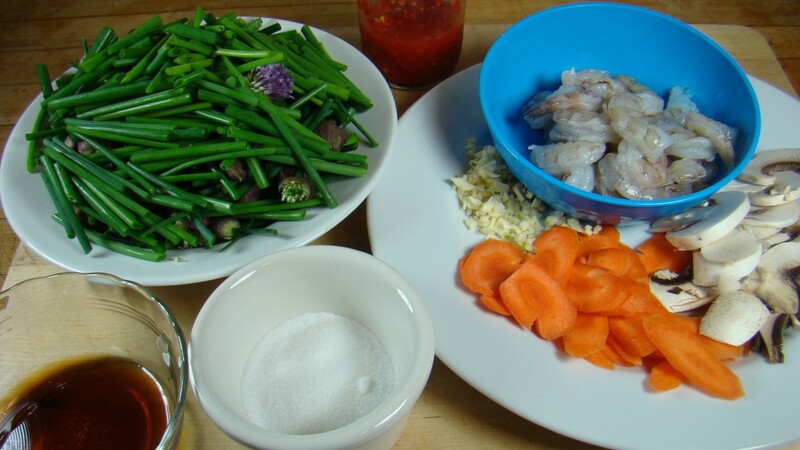 This simple dish was ready in the time it took to make the rice, and was delicious with the mild onion flavor of the chives complimenting the delicate shrimp. So there you have it, a way to eat the trimmings of your garden, what normally might show up in the compost pile. My chives have not flowered yet. I moved them last fall so maybe they will be later or maybe its colder here. I do enjoy their flowers. I think I will try to flavor some vinegar. I may leave them to go to seed so it can really take over in the spot it is. I’ll be making vinegar as well! Mine have spread enough, so harvesting the flowers is a must at this point! 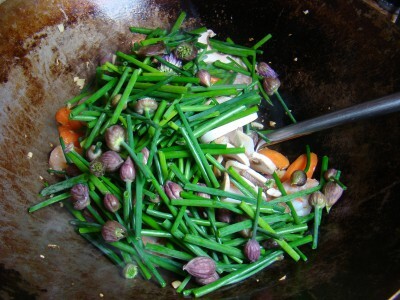 That is one of the stir fries I would love to have for dinner tonight! Hello and thank you for stopping by! It was super simple and delicious! That looks a lovely tasty quick supper that I would love!! Only have one chive flower at the moment though…mind you- my own fault as I’m cropping the chives regularly at the moment for all manner of dishes! It was very good Green Dragonette! How are you using yours? For instance snipping them into my bread dough as I then get the mild onion taste without making the breads too ‘claggy’ that I sometimes get if adding onion to the mixture. Recently did a cheese (Parmesan) and chive bread and a chive and walnut. That sounds delicous, I will have to give it a go! Nice idea [apart from the shrimps, of course! 🙂 ] It’s very convenient when plants have flowers that are not only decorative but edible too. I must admit that I love seeing the chive flowers blooming, so I tend not to cut them. Chicken, pork or beef could all be substituted, of course it could be meatless as well! I miss my chive patch for this very reason. I enjoyed cooking with the blossoms as you did here. This looks like a delicious dish, David, and a great way to welcome Spring. How would you prepare them John? I mostly used them as I would fresh parsley to finish a dish. I crumbled a couple blossoms over pasta dishes — particularly good with aglio e olio — atop salads, and over risotto. I sometimes mixed the crumbled blossoms with the pasta when I added it to a basic cream sauce. They wilted in the heat without being completely destroyed. 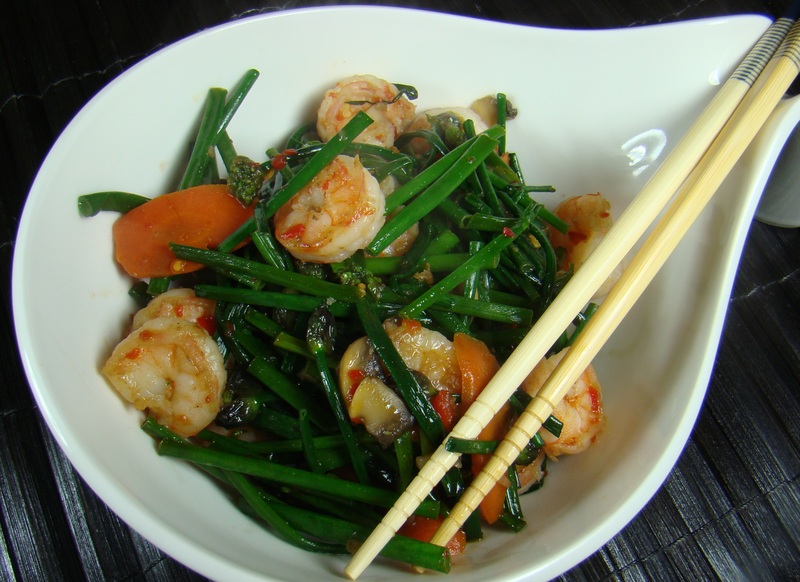 I had no idea you could eat the flower stalks and this recipe looks really good too!